Pamper your feet with these beautifully-crafted crocheted gladiator flip flop sandals. The cool and chic design will definitely add style to your outfit! They’re the perfect go-to footwear on fun days at the beach! In fact, this pattern is an ideal project for experienced beginner crocheters looking to advance their crochet skills. The pattern contains detailed written instructions for several sizes: toddler, child, and adult. Also included in the pattern are photos that will aid you in making these crocheted flip flop sandals, step by step. This crochet pattern is a beautiful design by Amanda Julien. In fact, you can access the FREE pattern for these crocheted gladiator sandals from her website. 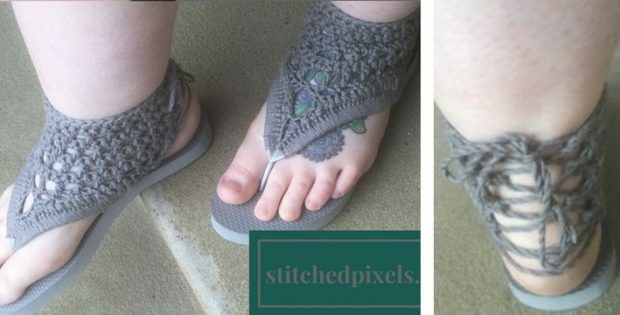 To access the FREE pattern for this pair of cool crocheted footwear, please click on this link: Gladiator Flip Flop Sandals Pattern. Featured image: Stitched Pixels – thank you!